It’s easy to forget or ignore the many health and safety risks we all face at work, moving on ‘autopilot’ while mentally daydreaming of something else entirely. In all professions this is dangerous, but it is a particularly bad habit when you are in an industry that requires working at height. As a matter of fact, falls from height are currently the single biggest cause of workplace deaths within the United Kingdom (roughly 6,300 last year), and are thought to account for a third of workplace fatalities. This is not to mention the second largest danger – that of dropping heavy objects. Trust me, even the lightest of tools quickly becomes heavy when falling from a great enough height. Together the two accidents make a lethal combination, so the message is simple: don’t get complacent while working at height. Staying fully alert in the workplace is therefore very important, as even when we’re wide awake accidents can still happen. So, what can be done to minimise the dreadful risks posed by working at height? Well, before we go into the dangers of working at height, we are first required to ask what ‘at height’ actually means. The Health and Safety Executive cautions us that any place where, without precautions, a worker could fall a sufficient distance so as to cause personal harm, is considered to be ‘at height’. Because of the inherent additional dangers of working in these places, the very first and most important bit of advice is to avoid doing so where possible. This might require modifying a design, or doing the work from underneath, such as using a mobile platform in a building to repair a roof. There are also some low risk situations where common sense will tell you no particular precautions are necessary, such as working as a seated operator in an excavator, and the law recognises this. Yet for the three million people in the UK who ply their trade at height on a regular basis, in most instances work at height deemed dangerous cannot be avoided. This makes strong health and safety knowledge imperative. There are many difficult jobs based exclusively around working at heights, requiring dexterity that cannot be achieved by using extendable tools from ground level. And so, it is unavoidable for many tradesmen that ladders, scaffolds, and other similar equipment are a central part of their everyday working toolkits. As with many of the most common health and safety hazards the first and most important step is for you, or a designated health and safety representative, to conduct a risk assessment of your workplace. This allows for the possible pitfalls to be identified and prepared for ahead of time. While some might find this tedious, it is far better to use a short period of time to prepare for a future danger, than to spend long stretches unable to work due to poor preparation and resultant injury. Each year 700,000 working days are lost to falls – a horrifying number for employees and hirers alike, yet it is one that could be so easily reduced by applying due diligence beforehand. For guidance, it’s worth checking what the legislation has to say. The Working at Height Regulations 2005 require all work at height to be properly planned, supervised and carried out in a manner which is, so far as is reasonably practicable, safe. Where a user cannot avoid working at height, they must use work equipment or other measures to prevent falls, and where they cannot prevent falls, work equipment or other measures must be used to mitigate distance and consequences of a fall if one should happen. Contextual factors to be considered while doing so are place, equipment, risks, and weather conditions, all of which have huge impacts on the level of danger a worker might face. Working with faulty equipment placed, for example, on uneven ground on an icy day is a nightmare scenario, and one a risk assessment is designed to prevent. The first step of any good risk assessment is to identify the potential hazards. In most cases, accidents from height happen when the worker loses balance, either by slipping or tripping, being knocked off balance by the wind for example, high-pressure jetting, or struggling to manage another high-powered tool. Different precautions must be taken depending on whether ladders, platforms or scaffolds are used, and also depend on the condition of the roof: if unprotected or fragile, duckboards may be required. Bear in mind also that it is not always necessarily those working at height in danger, but others who may also enter the workspace. It is not as uncommon as we’d like for falling tools to cause serious injury. With all of these dangers, it is imperative that only people with sufficient skills, knowledge and experience should be chosen to handle jobs at height. A good risk assessment requires lots of questions to be asked, the solutions for which will then form the strategy for operations. Who will come into the workplace, and what risks will they face? Are some groups more at risk than others? What measures are there in place to deal with the risks? Are regular inspections carried out? As far as is reasonably practicable, employers should inspect the surface, and every parapet, permanent rail or other such fall protection measure of every place of work at height prior to its use. Record your findings if you have five or more employees. The final stage thereafter is to regularly review the assessment, as working conditions and circumstances always change - sometimes more than we notice. If any significant changes take place, make sure that precautions are still adequate to deal with the risks. With risk assessments, a pragmatic approach is always best. So, let’s assume you’ve assessed the risks and, try as you might, you can’t conceive of a way the given job can be performed without working at height. Perhaps the crane is temporarily out of action, or there’s not an extension hose long enough to clean the windows on the top floor. The next step now is to think of mitigating the hazards of falling – whether it’s people or materials plummeting. It may sound obvious, but the best way to do this is to reduce the possible distance of a fall. Useful tools to help here are rope access and fall arrest systems, which must be properly fitted, with training given on proper use. Sometimes these systems are not always convenient, and don’t offer the required freedom of movement. In these instances, measures such as air bags and nets can cushion falls, if they should happen. As so frequently is the case, personal protective equipment (PPE) can keep workers safe when used correctly; however, even the most reliable of safety equipment can be a danger in the wrong hands. All workers should be properly trained in any equipment they have to use while working at height. I’m not just referring to the use of the equipment – setting them up for use is probably the most crucial element. The effects of wind, for example, are more pronounced at higher altitudes and when carrying large sheet materials, so repairing a sheet roof in high winds is just asking for trouble. The best advice here is to use only equipment that you are trained to use, that has been set up by a professional, and even then should only come following a risk assessment. The Work At Height Safety Association (WAHSA) strongly recommends that all users of fall protection equipment are given instruction on pre-use checks and the appropriate products for a given work situation. Ladders are usually used when the risk assessment undergone shows a low risk, and the duration of usage is set to be short – with the HSE defining ‘short’ as no more than 15-30 minutes on the task. Before using a ladder, conduct checks on its usability. Check the stiles are in good condition (not bent or split), the feet are not missing, worn, or damaged, and the rungs are not bent, missing or loose. These might sound like obvious precautions, but you would be surprised the amount of times they are forgotten. The next step is securing the ladder. The best way to do this is to simply tie it to a suitable point, ensuring both stiles are fixed. Where this is not practical, it may be secured with an effective ladder stability device. If that’s not possible, the ladder may be secured by wedging the stiles against a wall. If all other options are out of bounds, then and only then, foot the ladder. Footing is the last resort, and where practicable must be avoided. When ladders aren’t viable, perhaps due to the time needed to work, or the freedom of movement required, other more complicated equipment must be used. 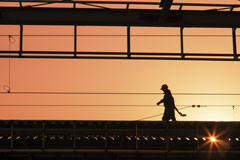 This might include scaffolding, working platforms, and in the case of roof work particularly, rails. Many people assume these measures will be safer, as they offer workers more room to move about, but there must be a great deal of planning before anything is deemed safe to walk on. There are many types of platforms commonly used to support work at height, including towers and general scaffolding, mobile and suspended equipment and mobile elevating work platforms (MEWPs). While these can be costly for smaller businesses to buy, rental companies offer cheaper options. Platforms and existing structures must be stable and able to support the weight of the workers who need to use them as well as any equipment or materials they may need. This means it’s crucial that they are footed on firm, level ground, or on a stable structure to prevent them from moving. Locked castors or base plates must be properly supported. If they’re not supported, move the structure. Never use bricks, blocks or other balances to support the weight – this is a recipe for disaster. As an example, scaffolding should be firmly tied to an existing structure, to prevent it from swinging in the wind. An employer also has a duty to inspect any and all types of work equipment, from guard rails, toe-boards, barriers and other protective items, to fixed working platforms (e.g. a scaffold around a building) or MEWPs (e.g. a scaffold tower). For work requiring higher mobility, there are vehicle-mounted platforms (VMPs), or trailers which may be attached to vehicles. The more advanced of these can offer up to 100 metres of additional reach. Picking the right platform for the job is half the battle, and a risk assessment can once again help you with this decision. Whichever platform is to be used, those selected to work on it must be suitable; it must also be erected and dismantled by people who have been trained and are competent to do so. Competence, according to the HSE means someone trained, with the necessary skills, experience and knowledge to manage health and safety. Guidance on appointing a competent person can be found at www.hse.gov.uk/competence. As for the scaffolds themselves, separate regulations apply. For example, tower scaffolds must comply with the BS EN 1004 regulation, which ensures that minimum requirements for materials, dimensions, design loads, safety and performance are met. Once the structure itself is secure, it’s time to check the parts which are to be walked on – roofs, walkways and the like. Roof work, in particular, is high risk for two reasons: firstly, the threat of workers falling, and secondly, the threat of fragile roofing materials falling and striking passers-by. Even if you’re using well-fitted scaffolds, you may still need to place duckboards over fragile roofs and other flimsy surfaces that may be walked on. If roof work is your metre, guard rails, boards or other barriers such as toe boards can come in handy to prevent anyone from falling off the edge of platforms or roofs, or through holes or openings in the platform floor. Because of the distance these items – or people – fall, accidents can be debilitating, or even fatal. While the most dangerous industry by some distance is construction, accidents have been known to occur on roofs of factories, warehouses and farm buildings when roof repair work or cleaning is being carried out. Roof lights, liner panels, cement sheets, glass, metal, slates, tiles and chipboards are all likely to be fragile, so great care must be taken in handling them. Fragile roof accidents are always preventable, and the proper planning process can prevent serious harm. Falls through fragile surfaces, particularly fibre-cement roofs and roof lights, account for 22% of all fatal falls in the construction industry. Don’t let yourself become a statistic. It may sound obvious, but many people forget that equipment used outside is exposed to conditions that may cause it to deteriorate. It goes without saying that the consequences of lax checks can be devastating in the case of working at height. Let’s not make that mistake. Outdoors equipment should be inspected at suitable intervals, appropriate to the use and environment – the more hazardous, the more frequent. According to the HSE, any working platform used for construction work and from which a person could fall more than two metres must be inspected, at intervals not exceeding seven days. Every time something happens that may affect the safety or stability of the equipment, e.g. accidental damage or a sudden storm, make sure you perform safety checks. Despite the well-documented legal requirements placed upon them, there are unfortunately many employers who still fail to prepare their staff properly for dangerous work. Some employers might avoid giving out protective equipment, while others may neglect to train their staff thoroughly. This kind of negligence occurs because employers put their time and money before the lives of their employees, and ignore the available legislation. Ironically, when accidents and fatalities inevitably happen as a result, the same managers will usually spend much more time and money trying to settle the damages caused. If you should be unfortunate enough to suffer an accident due to inadequate health and safety precautions, you may be eligible to make a claim for compensation. Health and safety regulations may seem stringent, but they are there for a reason, and especially so when working at height. Failing to properly plan for the specific requirements of the job can be the difference between life and death, and employers should take note. It is easy for an employee to presume that an employer will be aware of the risks posed to them and act to mitigate those risks. Yet sadly, time and time again in my career I’ve seen cost cutting measures take priority over safety and wellbeing. Many personal injury claims could be avoided if simple health and safety best practices were clearly defined and understood by both employers and the employees. It is better to have such measures in place than to regret their absence after what could be a serious and debilitating accident. If you don’t think you’re ready for a job at height – whether due to faulty or inadequate PPE, lack of proper training or failing to plan for possible events, then you should speak to your employer. They should have your best interests at heart, and if not, you might be putting yourself at risk. If you want to take action for your business, there are plenty of detailed resources out there to act as a guide. For general information, the HSE is of enormous benefit. The International Powered Access Federation (IPAF) gives detailed information on the use of MEWPs, and the Institution of Occupational Safety and Health (IOSH) provides specialist brochures on crucial details. As this article has detailed, there are many different considerations to make when planning for jobs at height. These best practices are in law for a very good reason: they save lives. Worker happiness and health are the lifeblood of any business – don’t let these suffer due to careless or lazy health and safety practices, or it’ll be your medical bills scaling the heights – and not your company.